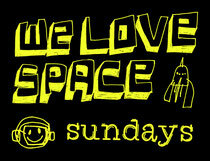 We Love… continuous its legendary Sunday party at Space Ibiza with some great acts booked over the next few weeks. New talent comes in the form of Jets live with Jimmy Edgar and Machinedrum this Sunday, 25 August and on 8 September Tijana T makes her We Love... DJing debut after last appearing on the lineup as a vocalist with Abe Duque back in 2007. Special shows are also lined up with Duke Dumont on 15 September, along with Leon Vynehall and also Kiwi who will both be playing as part of the Chew The Fat! 15th birthday extravaganza. Floorplan makes his Ibiza debut this Sunday 25 August. Glasgow DJ and Numbers label founder Jackmaster is back for his second show of the summer on 1 September and Boddika returns on 15 September after his performance in July. Tiga and Dirtybird director Claude VonStroke will be playing their only Space shows this summer this Sunday and 8 September respectively. Also on 8 September will be a We Love Recordings Presents We Love... Detroit label party with Derrick May Vs Jimmy Edgar. Chapter 2 of the We Love... mix series sees an exclusive session from Italian DJ Ralf. Ralf has been at We Love... as a weekly resident for the whole of August as part of their Savana Potente take over. Just click the download button above to grab yours.